A limited edition with just 6000 bottles being released worldwide. This has been entirely aged in virgin (new) oak barrels in the same way that a Bourbon whiskey is matured. As you would expect there is a bit more influence and 'oakiness' from the barrel than you would normally expect. The virgin oak has added some very nice fruit, spice and vanilla notes which have partnered well with the lemon, smoke and floral notes of the malt. 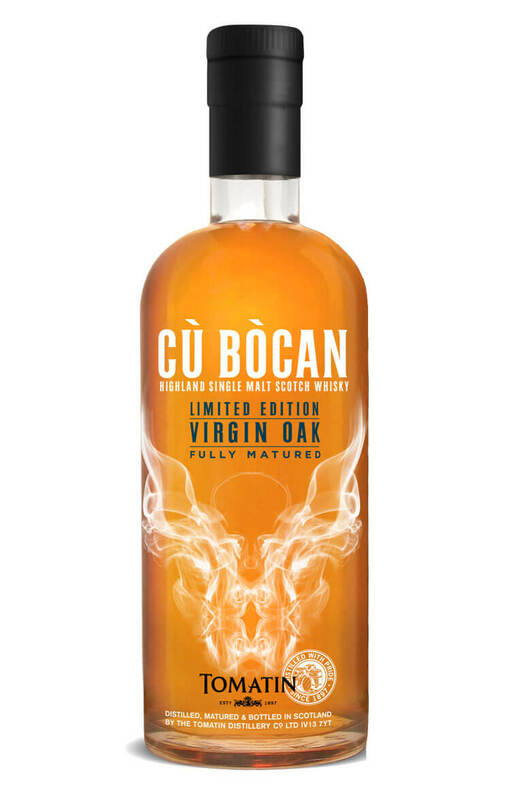 Cu Bocan is Tomatin Distillery's lightly peated malt and is only made in very small batches. Aromas (without water) Lively citrus fruits – lime juice and lemon sorbet. Oak driven flavours of vanilla, coconut and candy floss soon emerge with rosewater, red berries, fresh pear and pineapple in the background. Palate (without water) Warm pecan pie with vanilla ice cream. Baked apples with cinnamon and toffee and just a touch of smoke. Types of Barrel used for Aging Entirely aged in virgin oak barrels.